1. Do NOT toast the bread. Leave it as is. 2. Spread the margarine on one side of both slices. 3. 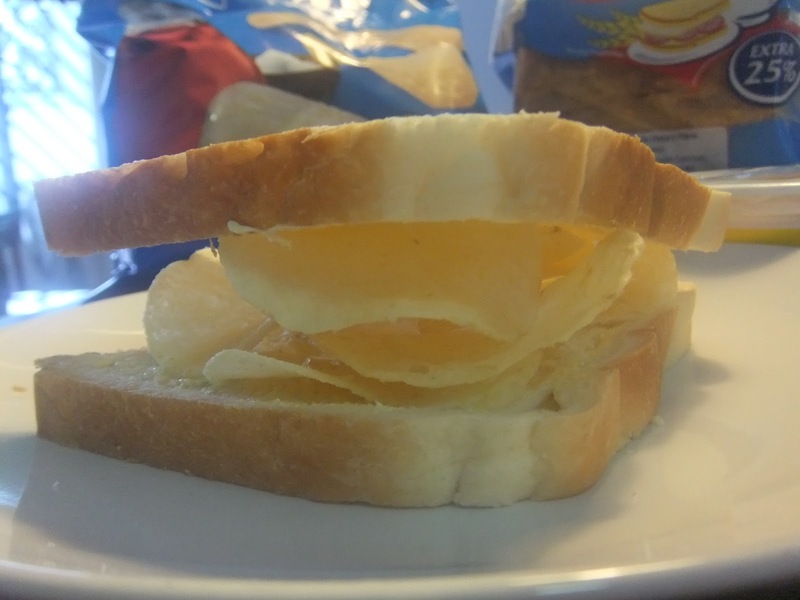 Place a sufficient amount of crisps on one of the bread slices, buttered side up. 4. Once satisfied with the amount of crisps on your bread, place the other bread slice on top of the mound of crisps, buttered side down. When I was in elementary school I used to mix Nutri Star Red or Blue with my rice for lunch whenever I don’t like my packed lunch. Lately I discovered that my favorite Sour Cream and Onion Lays is perfect with rice so that’s what I usually have whenever I don’t feel like eating our staff meal. So here’s another ‘dish’ to add to my not-so-healthy meal. And due to my friend’s raves on how great a Crisp Sandwich is, I’ve decided to try and make one for myself now (Well, I made one for him last night, I just didn’t try because I was too full). For it to be an authentic, English-style Crisp Sandwich, stick to these ingredients. Otherwise, you may use other ingredients according to your preference. You may substitute white bread with Wheat or Multi-grain for a healthier twist. Butter or mayonnaise instead of margarine. It’s pretty hard to find a Salt and Vinegar flavored crisp here in SG unless you go to those Ang Moh (Caucasian) grocery stores in the city. Good thing Lays does not disappoint. I would prefer Sour Creme and Onion flavored crisps but I have this feeling I’d violate an unspoken English rule about replacing that Salt and Vinegar. And of course, this meal is best enjoyed with a cup of tea.